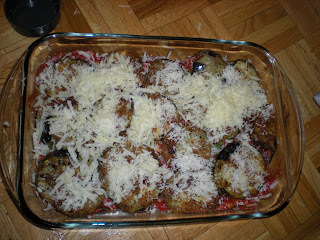 I found an interesting eggplant lasagna recipe and decided to test it on my usual Friday night's cooperative cooking. I never used "western" eggplant, I'm used to the asian one. I realized that these eggplants are very sensitive to change of temperature and must not be cook at very high temperature, otherwise it will burn. This just happened to me today. 1. Peel in stripes leaving half unpeeled. Cut eggplants into 1/2 inch slices. 2. Beat eggs and season with salt and pepper. 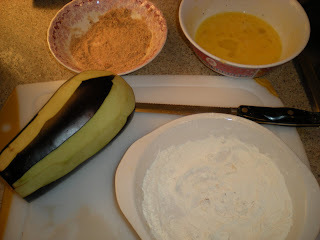 Dredge each eggplant slice in flour, shake off excess. Dip it in eggs and let drip back into bowl. Finally, coat it with bread crumbs. 3. Heat oil in large skillet over medium heat. 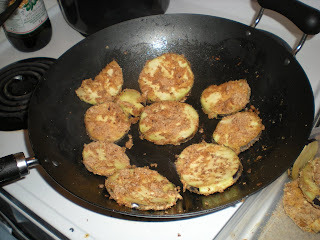 Work in batches, fry slices until golden about 2-3 minutes each side. Remove and use paper towel to drain oil. 4. Preheat oven to 325F. 5. 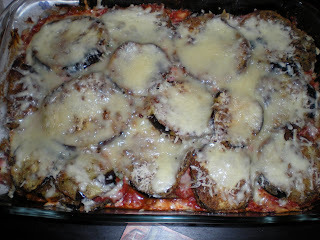 Layer tomato sauce, eggplant slices, mozzarella, parmesan and basil leaves in 13x9 inch pan. Season each layer with salt and pepper. Finish with sauce and cheese.